Posted on August 18, 2017 at 2:19 pm. 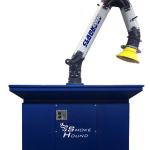 For removal of Weld Smoke we recommend our Smoke Hound units. There is an option for every job size!